Cherry Lane Cattery is a family run business. The cattery has a mineral felted timber roof and comprises 18 single units (1.8m x 0.9m) and 6 double (1.8m x 1.8m) units, each 1.2m deep containing fully lined and insulated sleeping accommodation, elevated 700mm above a concrete sealed and washable floor. Full height sneeze barriers are fitted between adjoining compartments, each of which have a shelf, ladder, window and cat flap, all cats have thermostatically controlled heated beds. An integral safety corridor extends the full length of the cattery, in order to prevent the residents from attempting to leave early. A separate isolation unit is available, should any of the boarders be taken ill during their stay. Peak seasons are May to September including Easter and Christmas. Provisional telephone bookings are advisable so not to be disappointed. If you are due to arrive late, I will need to be informed. I am open all the year round with the exception of Bank Holidays, when no admissions or departures will be allowed. 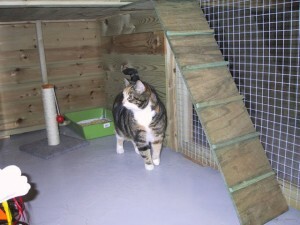 I can cater for up to four cats in the same pen, provided they are from the same household. All animals will be given a health check upon arrival, and any found to be suffering from infectious or contagious diseases will not be accepted, including others from the same household. I can provide a local pet collection service on request. Pets must be collected no later than 18:00 hrs., unless otherwise agreed with proprietor. We can provide a local, pet return delivery service on request. All pets collected after 12 noon will be charged for a full day. I will provide adequate bedding for each animal as it comes to stay, but if owners prefer they can bring their own bedding, scratching posts, toys, etc this is acceptable. Litter trays will be provided with a range of litter from gravel and fuller’s earth to wood-pellet and biodegradable paper.